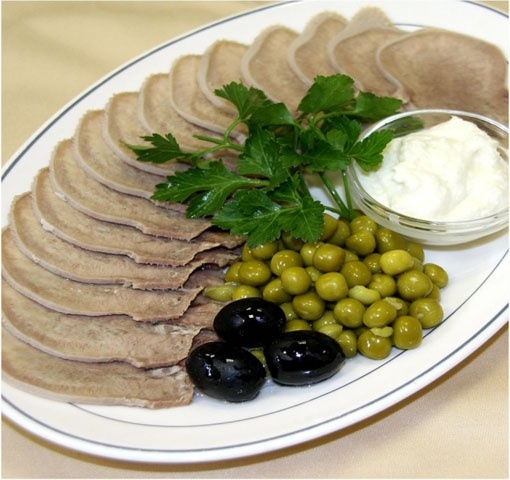 Boiled tongue, sliced, seasoned with spices, topped with garlic or horseradish, all the time was an exquisite delicacy. Language can not only cook, but bake, for example, in the oven. A delicacy if cooked properly, the flesh is very tender and tasty. To cook and properly clean the tongue does not need to be a chef, enough to know some tricks and fine cooking. Rinse the tongue, lightly whisk and place in a deep pot. Cover with water, add spices (black pepper, Bay leaf). Bring to a boil, then set on low heat. Cooking time language depends on the age of cattle, but the average is from 2 to 4 hours. To determine the readiness of language, pry fork skins – if it comes away easily, it means that the language is ready – if not, then you should keep cooking. When the tongue will cook until ready, remove it from the pan and cool under ice-cold running water or dip in bowl of cold salted water. White film is removed in the water after the rapid cooling, it is removed very easily. Language can also be boiled in a pressure cooker (ready time is reduced almost in three times), cook in clay pots, you can prepare the aspic. But whatever cooking method you choose – cleaning technology to remove cooked tongue one and the same. The taste was tender and juicy, after cleaning the film, you can put it in a pre-salted broth in which the language previously cooked. When the tongue has cooled it can be cut into medallions or serve whole. The language is cut obliquely with a sharp knife. A delicacy usually served with boiled vegetables such as potatoes, carrots, cauliflower, green peas. You can put it on a plate with the language of pre-prepared sauces (sour cream, butter, mustard), sprinkle with the herbs.